I have been with CPG during the last 15 years as faculty in the Geosciences Department. My teaching and research areas of interests include Geology, Sedimentology, Stratigraphy Basin Analysis, Clastic Depositional System, Petroleum Geology and Paleozoic & Mesozoic Sandstone Reservoirs. I have supervised several Summer Field Geology trips and mapping projects for over twenty-five (25) undergraduate geology students. Graduate courses I taught covered Advanced Sedimentology, Advanced Stratigraphy, Petroleum Geology, Independent Studies, and Geology Seminar. 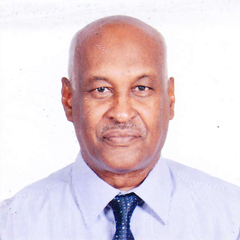 I supervised over 50 M.S and Ph.D. thesis at U of K in Sudan and KFUPM and have many publications in journals and conferences. I conducted around 23 internally and externally sponsored projects from KFUPM, SABIC, KACST, DTV Halliburton, and KAP and NSTIP research projects. The outcomes of these research projects are numerous including journals and conferences publications and presentations, graduate students (Ph.D. and M.Sc.) thesis, training for faculty, students and technicians and laboratory development and modernization. Contract research work was done for Greater Nile Petroleum, Talisman Energy, Ministry of Energy and Mining Sudan, RI-Saudi Aramco, Luksar, and Sinogas. Recently my research deals with Sedimentology and Petroleum Geology aspects and utilization of outcrop reservoir analog models for the purpose, understanding and prediction of subsurface aquifers and hydrocarbon reservoirs in Saudi Arabia. Carried out more than fifty (50) geological field trip related to teaching, graduate student, research and sponsored research projects in different parts of Saudi Arabia. I am a member of the Saudi Stratigraphic Committee, the Dhahran Geoscience Society(DGS), International Association of Sedimentologists (IAS) and the European Association of Geoscientists and Engineers (EAGE). Participated as a member in several conferences and technical workshop technical committees (AAPG, EAGE, IPTC, GEO) as well as a session chairperson. Ph.D. in Geology, Department of Geology, University of Khartoum, SudanTitle of thesis: “Sedimentology of the Late Jurassic / Cretaceous-Tertiary strata of the NWMuglad and the Nile rift basins Sudan”, Supervisor. – 1988-1992. Post-Graduate Diploma in Exploration Geology 1986, Dept. of Geology, University of Alberta, Edmonton, Canada. 1984-1986. M.Sc. in Industrial Petrology (Geomaterials) 1982 Queen Mary College, University of London, UK. Title “Correlation between strength and fracture spacing of rocks and the ease of Excavation”. 1981-1982. Post-Graduate Diploma in Mineral Exploration and Photo-interpretation, 1981. International Institute for Aerospace Survey and Earth Science (ITC), Delft, the Netherlands. 1980-1981. B.Sc. (Hons.) Degree in Geology in 1978, Department of Geology. University of Khartoum, Sudan. 1973-1978. Covers areas of geology, sedimentology, stratigraphy, and petroleum geology aspects and reservoir properties of both clastic and carbonate rocks. Recent research interest deals with an application of outcrop reservoir analog for both Paleozoic and Mesozoic clastic and carbonate reservoirs in Saudi Arabia utilizing integrated field and laboratory stratigraphical and sedimentological techniques and digital outcrop analog mapping using laser scanning (lidar). The research aims to characterize and understand reservoir rocks heterogeneity that would allow predicting reservoir quality and architecture. Several student Theses and research projects deal with research in this area. Abdullatif O. M. & Cruden, D. M. “The relationship between rock mass quality and ease of excavation”.Bulletin of the InternationalAssociation of Engineering Geology, No 28, p 183-187.1983. Abdullatif. O. M.“Channel-fill and sheet flood Facies sequences in the ephemeral terminalRiver Gash, Gash, Kassala, Sudan”. Journal of Sedimentary Geology, 1989, V. 63, 171-184, 1989. Farah, E. A., Abdullatif, O. M., Kheir, O. M. and Barazi, N). “Groundwater resources in a semi-aridarea: A case study from central Sudan”. Journal of African Earth Sciences, V. 25 / 3, pp. 453-466,1997. Abdullatif, O. M., and Farwa, A. G. (1999) “Earth Science Education in Sudan”, Journal of African Earth Sciences, V. 28/ 4, 1999, pp. 5-27,1999. Lü, H, Lu, H., Abdullatif, O.M. and Kheir, M. “The Columnar Jointing in Cretaceous Clastic Rocksand the rotation of Rift Shoulder in Sudan”. Acta Geological Sinica, Volume 74, Issue 1, Pages 27-29,2000. Abdulkadir, I.T Sahin, A. and Abdullatif, Osman.“Distribution of petrophysical parameters in the Cambro-Ordovician Dibsiyah Member of the Wajid Sandstone, SW Saudi Arabia”. Journal of PetroleumGeology, Vol. 33 (3), pp 269-280, 2010. Abdullatif, O. M. .“Geomechanical properties and rock mass quality of the carbonate Rus Formation ,Dammam Dome, Saudi Arabia”. TheArabian Journal for Science and Engineering, Volume 35, Number 2A, p 173 – 197.2010. Ayad, M.I., Abdullatif, Osman. and Ali, O.B .“Depositional Environments and Reservoir Heterogeneityof Bentiu Formation (Albian – Cenomanian), Muglad Rift Basin, Sudan”, Sapeg (Sudanese Association of petroleum Geologists) Journal, First Issue, P.4-21, 2011. Abdulkadir, Ibrahim Taiwo and Abdullatif, Osman M., “Facies, DepositionalEnvironments, ReservoirPotential and Paleogeography of the Cambro-OrdovicianDibsiyah Formation, Wajid Basin, Saudi Arabia”, Arabian Journal of Science andEngineering ,Volume 38, Issue 7, Pages 1785-1806 ,July 2013. Eltom ,Hassan ,Makkawi, Mohammad ,Abdullatif, Osman and Al Ramadan ,Khalid. “High Resolution Facies and Porosity Models of the Upper Jurassic Arab-DCarbonate Reservoir Using an OutcropAnalogue, Central Saudi Arabia”2012.Arabian Journal ofGeosciences.Volume 6, Issue 11, Pages 4323-4335, November, 2013. Eltom, Hassan, Abdullatif, Osman and Mohammad Makkawi and Abdulraziq, A.”Microporosity Estimationof the Upper JurassicArab-D Carbonate Reservoir: Outcrop Analog Approach, Central SaudiArabia”Journal of Petroleum Geology., Vol. 36(3), pp 1-18, July 2013. Eltom, Hassan, Abdullatif, Osman ,Makkawi, Mohammad Abdelgadir, Mohammad “Integration of Gamma Ray and Geochemical Analysis for Characterization of the Upper Jurassic Arab-D Carbonate”Petroleum Geoscience, Volume. 19, pp. 399–415, 2013. Eltom, Hassan, Abdullatif ,Osman , Makkawi, Mohammed and Asaad Abdulraziq, Asaad “Characterization and Modeling the Upper Jurassic Arab-D Reservoir Using Outcrop Data from Central Saudi Arabia”. GeoArabia, Middle East Petroleum Geosciences, Volume 19 no. 2, p. 53 – 84,2014. Eltom, Hassan, Abdullatif ,Osman, Makkawi, Mohammed, Al-Ramadan, Khalid and Asaad Abdulraziq ,Asaad “Porosity Evolution Within High Resolution sequence stratigraphy and Diagenesis Framework: Outcrop Analog of the Upper Jurassic Arab-D Reservoir, Central Saudi Arabia” 2013, Arabian Journal of Geosciences. DOI 10.1007/s12517-013-1251-4. Mohammed Benaafi1 and Osman Abdullatif1. 2015.”Sedimentological, mineralogical, and geochemical Characterization of sand dunes in Saudi Arabia”. Arab J Geosci DOI10.1007/s 12517-015-1970-9.# Saudi Society for Geosciences. Published. H. A. Eltom, O. M. Abdullatif, L. O. Babalola, M. A. Bashari, M. Yassin, M. S. Osman and A. M. Abdulraziq. 2016. Geochemical Characterization of the Permian-Triassic Transition at Outcrop Central Saudi Arabia. Journal of Petroleum Geology, Vol. 39(1), January 2016, pp 95 – 114. Hassan A. Eltom, Osman M. Abdullatif, Lameed O. Babalola, Mazin A. Bashari1, Mohamed Yassin, Mutasim S. Osman & Asaad M. Abdulraziq.2016. Integration of facies architecture, ooid granulometry and morphology for prediction of reservoir quality, Lower Triassic Khuff Formation, Saudi Arabia. Petroleum Geoscience. doi:10.1144/petgeo2015-071. Mahgoub, M. I.Padmanabhan E. Abdullatif, O. M. 2016. Sedimentological Reservoir Characteristics of the Paleocene Fluvial/Lacustrine Yabus Sandstone (Melut Rift Basin), Sudan. Submitted to African Journal of Earth Sciences. Journal of African Earth Sciences 123 (2016) 75-88. Mohamed A. Yassin, Mustafa M. Hariri, Osman M. Abdullatif. 2016 2016. Evolution history of transtensional pull-apart basin and its implication on hydrocarbon exploration: A Case study from Sufyan Sub-Basin, Muglad Rift Basin, Sudan Submitted to Marine and Petroleum Geology, Accepted.